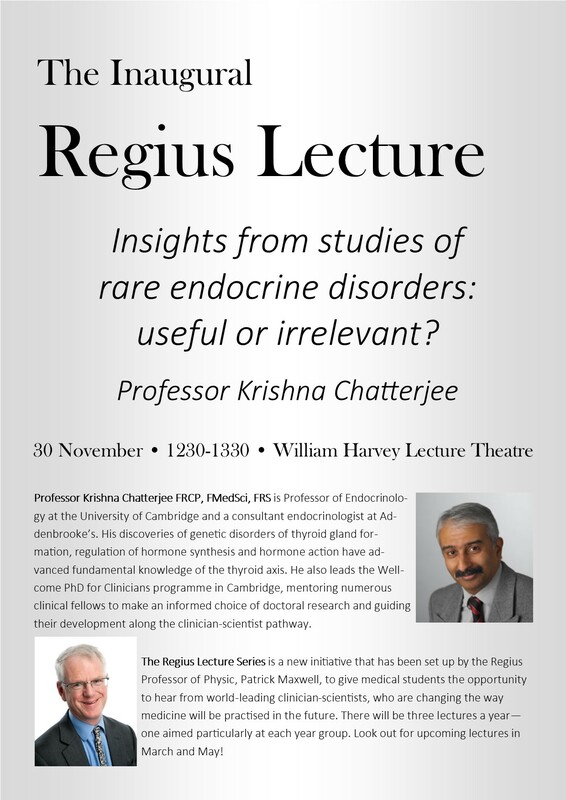 Regius Lecture: Insights from studies of rare endocrine disorders: useful or irrelevant? Home / School of Clinical Medicine / Events / Events / Regius Lecture: Insights from studies of rare endocrine disorders: useful or irrelevant? Professor Krishna Chatterjee FRCP, FMedSci, FRS, who will be giving the inaugural lecture, is Professor of Endocrinology at the University of Cambridge and a consultant endocrinologist at Addenbrooke’s. His discoveries of genetic disorders of thyroid gland formation, regulation of hormone synthesis and hormone action have advanced fundamental knowledge of the thyroid axis. He also leads the Wellcome PhD for Clinicians programme in Cambridge, mentoring numerous clinical fellows to make an informed choice of doctoral research and guiding their development along the clinician-scientist pathway. The Regius Lecture Series is a new initiative that has been set up by the Regius Professor of Physic, Patrick Maxwell, to give medical students the opportunity to hear from world-leading clinician-scientists, who are changing the way medicine will be practised in the future.